As many of you know, PETA demanded in court that I reveal the names of PETA employees who spoke to me on condition of anonymity about PETA’s killing of animals. The information they provided was used to corroborate newspaper articles, on the record sources, government documents received under the Public Records Act, testimony and information from civil and criminal cases against PETA, videotape evidence, and admissions of killing by PETA officials. Their testimony was used for a series of articles and ultimately became a book, Why PETA Kills. The PETA employees agreed to speak with me as whistleblowers. They expressed grave concerns about what they saw and wanted the public to know. They trusted me with the information and with protecting their identity because they reasonably fear retribution. Because I refused to reveal their names during a deposition, PETA filed a motion to compel disclosure. PETA claimed I was not entitled to the protection of the First Amendment because I am also an advocate for animals. Every crusading journalist in that pantheon of heroes cited by the court would have flunked PETA’s putative ‘journalism’ test, for their journalism was inseparable from their advocacy. Indeed, Sinclair and Nader took their advocacy onto the campaign trail and sought public office. Winograd and NKAC’s intertwined investigative and advocacy work are no different from that done by Nader and his nonprofit Public Citizen. The Court agreed. 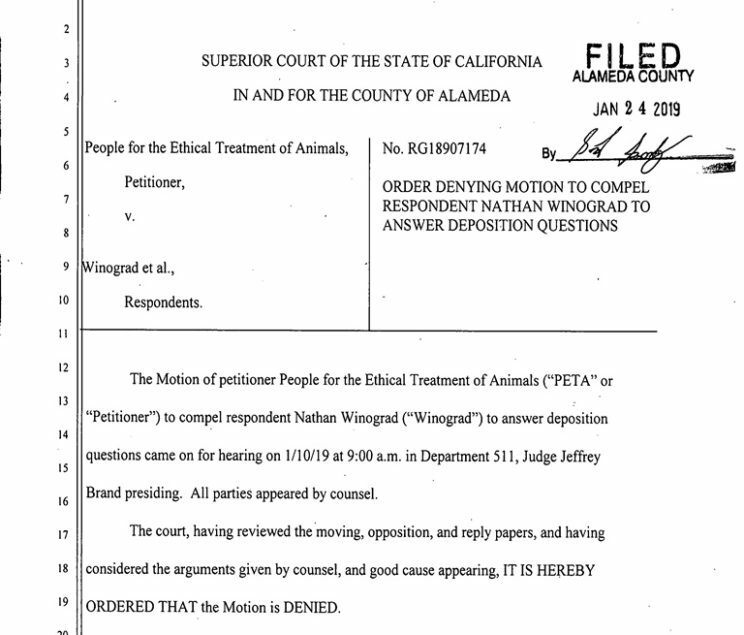 PETA’s motion to compel was denied. This is a victory for the animals, a victory for investigative journalism, a victory for new/non-traditional media, and a victory for the First Amendment. PETA’s killing of animals should also be alarming to every advocate for animal rights, every activist working to reform their local pounds, every animal lover who believes, as I do, that dogs, cats, rabbits, and other animal companions have the right to live; a right PETA continues to undermine every time they inject a healthy animal with a lethal dose of poison. I want to thank everyone who contributed to my legal defense fund. I want to thank the Reporters Committee for Freedom of the Press and the Press Freedom Defense Fund for taking on my case. I want to thank Joshua Koltun, my attorney and more importantly, warrior for the First Amendment. But most of all, I want to thank my wife, Jennifer, who reminded me — as I faced the specter of incarceration for refusing to allow my informants to be put at risk of retribution by PETA — that we all have a duty to honor the sacrifices made by generations before us by likewise defending the freedoms they fought for. We do that by standing up to oppression and abuse of power, even at our own personal peril.